An electric motor uses magnetic fields to convert electrical energy into mechanical energy. 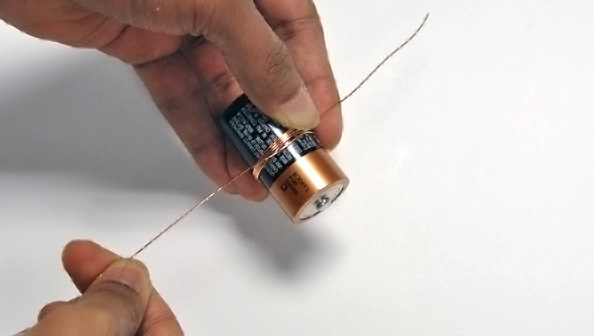 Follow these instructions to build your own electric motor. 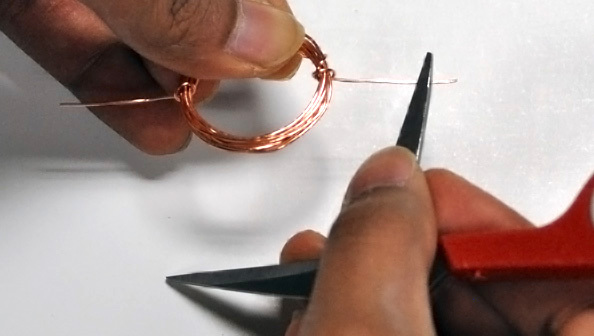 Gently flick the coil with your fingers. Immediatey the coil starts spinning. 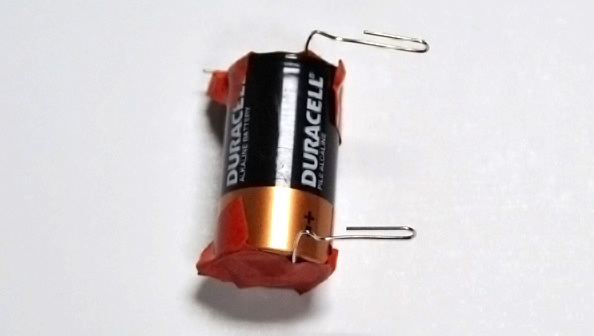 Try replacing the C-cell battery with a AA-cell or D cell battery. Do you notice any difference in the speed of the spinning coil? Try adjusting other elements of your motor, such as the number of ceramic magnets or the number of coil wraps in the magnet wire. Observe any changes in the way your changes effect the spinning coil. 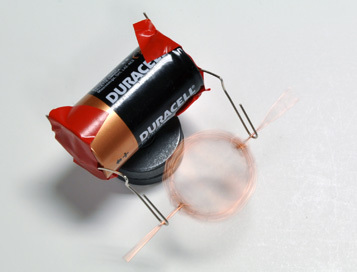 A wire carrying an electric current will experience a mechanical force when placed in a magnetic field. That is, the magnetic field actually exerts a "push" on the wire. The force of this push relates directly to the intensity of the current, the strength of the magnetic field and the length of the wire. The direction of this mechanical force (or push) on the wire depends on the direction of the current and the magnetic field. You can visualize this relationship by using the "left hand rule" (see Figure 1). If the first finger points in the direction of the magnetic field, the second finger in the direction of the current, then the thumb represents the direction of the force thrust (or motion). 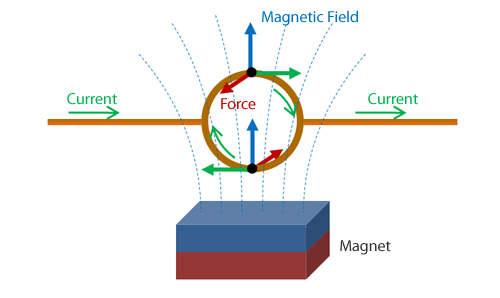 Figure 1: Force experienced by a current carrying wire in a magnetic field. 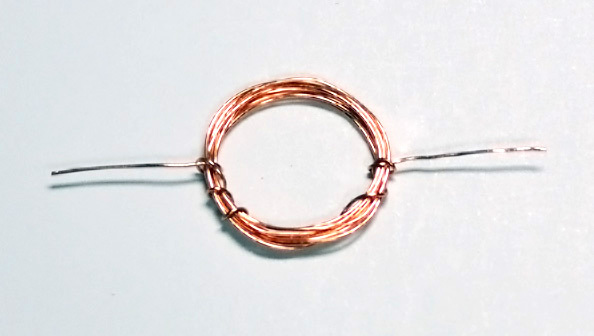 This phenomenon makes the coil in your motor spin. 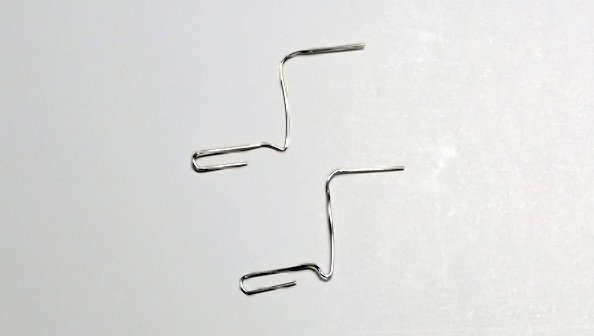 When the scraped half of the axle rods come in contact with the paper clips, the circuit is made. 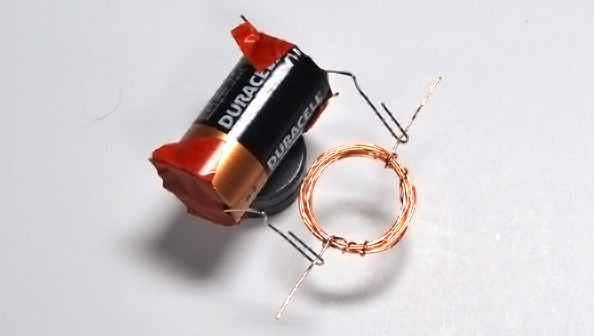 Current flows from one end of the battery through the looping coil to the other end. Note that the current flows in opposite directions at any two opposite sides of the loop. 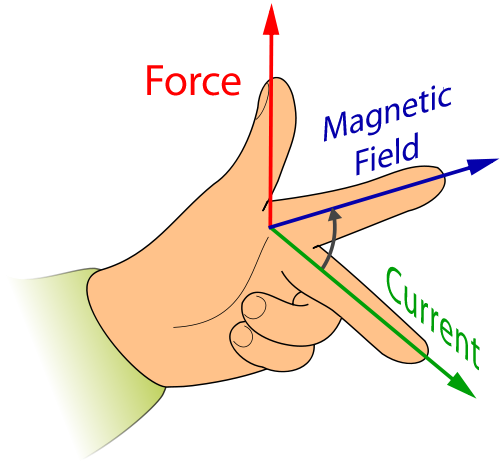 This implies that, in accordance with the left hand rule described above, the two opposite sides will experience forces in opposite directions. The pair of forces will have a turning influence on the coil and the coil spins. After about half a turn the insulated part of the axle comes in contact with the paper clips. The circuit is broken. Current stops flowing and the coil no longer experiences the force. However, the momentum carried during the first half of the spin simply enables the coil to complete the spin. The circuit is made again and the cycle continues. The coil spins freely. Figure 2: The forces in opposite directions have a turning effect on a current carrying coil in a magnetic field. "Electrical motor." Wikipedia, The Free Encyclopedia. [Online]. Available: http://en.wikipedia.org/wiki/Electrical_motor. [Accessed: Jan 20, 2010].